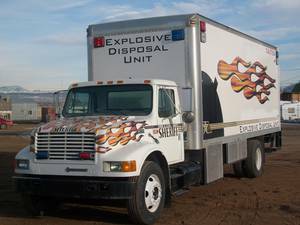 The Lewis and Clark County Sheriff’s Office Bomb Squad was formed in 1999 and currently consists of four bomb technicians: Deputy Josh Van Dyke, Deputy Ken Getz, Deputy Marvin Weber, and CIB Sergeant Eric Gilbertson. 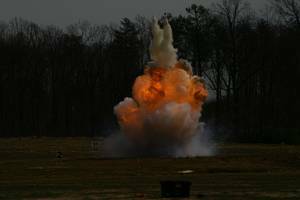 All are certified bomb technicians and graduates of the FBI Hazardous Devices School/Huntsville, AL at Redstone Arsenal. The bomb squad meets the equipment requirements as mandated by the FBI for a certified bomb squad. Some of the equipment the bomb squad has consists of the following: five bomb suits (one Med-Eng 9, two Med-Eng 8s, and two Med-Eng SRS-5s), four x-ray machines (one XR-200, one RTS-4, and two ScanX), seven disrupters (PAN), three stand alone and two each on the robots, and three Viking ISI SCBAs. The bomb squad currently possesses a Remotic Andros Wolverine robot and an ICOR MK3 Caliber robot. The above, along with other equipment which enhances the capabilities of the bomb squad, is housed in two bomb trucks: a 38’ diesel powered truck and a F-550 four wheel drive diesel with an 18' stand-up box. The bomb squad’s expertise is currently called upon over 70 times per year. The bomb squad has a MOU with the Missoula County SO/PD Bomb Squad. The LCSO Bomb Squad is capable and willing to handle the needs of Lewis and Clark County and other agencies that call upon us.